Since early days of reforms, China’s rapid development of its service industry, both service trade import and export volume increased, but, in general, the openness of China’s service trade is not very high, and neither the field is wide. This is because China has long regarded as the global manufacturing powerhouse industry, but does not pay much attention to the development of producer services. Although the introduction of multinational manufacturing practices, services for multinational corporations but often productive service sectors still remain excluded. China’s service industry has been open for business along with manufacturing sector, but the degree of openness is far lower than in manufacturing. At present, China’s openness to foreign investment service industry is about 7% more than when we join the World Trade Organization (WTO) commitments but much lower than in Western countries in recent years, trade in services sector accounts 10%. As early as in 1999, an openness of the United Kingdom, Korea, Italy, France, reached 12.0%, 11.9%, 11.3% and 10.6%. At present, China still has many industries; especially the low degree of openness for modern service industries such as telecommunications, civil aviation, and railway sector (which is still quite heavily monopolized). Monopolization results in poor quality of service and drives market competitiveness at lowest gear, which not only damages the interests of consumers but also hindered the development of the overall industry. In fact, the growth in China’s service industry can be accelerated by adopting the openness of trade in services which largely depends on a large development. The primary key is to absorb foreign advanced technology, experience and increasing the trade volumes in high value-added services which will eventually add necessary value to China’s service industry. 1. Lack of a unified trade in services coordination and management departments at the central level. 4. Issues related to cross-management of various functions via various intermediaries. 5. Inconsistent with international practices. Although the current international trade in services showed the general trend of liberalization and globalization, but to protect certain domestic industries and their vulnerable services, countries with a weak international competitiveness of the domestic service market opening tend to impose many restrictions . In the future between the developed and emerging countries in the field of service trade liberalization will aggravate the opposition, the hidden barriers to services trade. This will continue to reflect the trend. As a developing country, China’s trade in services, the main advantage lies in tourism, construction, transport and other labor-intensive service sectors. These services require the low-skilled labor as intermediate inputs along with the movement of persons. But in developed countries, the issue of cross-border movement restrictions are more about natural persons providing their services for the commitment in principle, but only with the establishment of commercial organizations providing services linked to a small number of senior management or technical staff mobility provisions of an exceptional commitment to the table, which makes natural persons providing services to a large extent only as “commercial presence” of the supplement, the cross-border flow is also highly dependent on the establishment of foreign business organizations in need. In addition, some, such as immigration restrictions, certification, technical standards, foreign exchange restrictions and other barriers to services trade has become a substantial export of China’s service trade barriers. Today’s world, service is the labor-intensive to technology-intensive , emerging trade in services relative share in total trade expanded. Modern service industry knowledge, technology-intensive industries, requires a large number of professional solid, high-quality technical and management personnel. 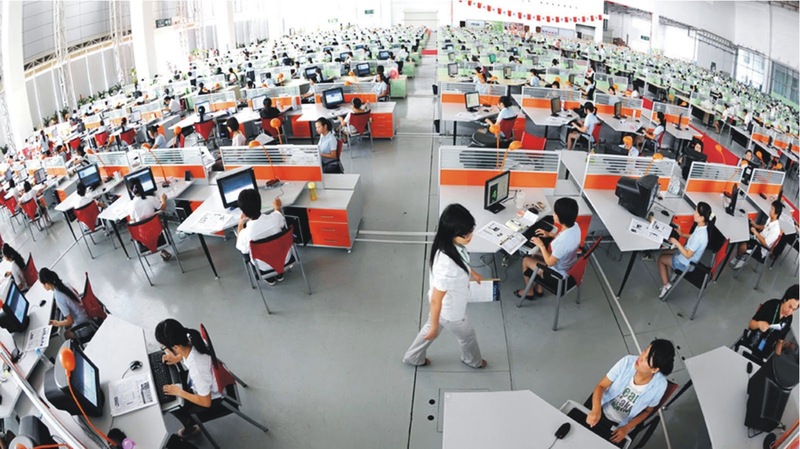 However, the comparative advantage of China’s service industry is labor-intensive services. Service providers only have a general culture of quality which can be enhanced with simple and complex training programs. Currently, China’s service industry does not enough emphasis on the training of professionals, led to the current quality of service sector employees not able to meet required international standards. This kind of situation cannot meet the supply needs of the modern service industry development, undermined China’s international competitiveness in trade in services. The overall level of development of China’s service trade is not high, especially in the structure left behind. Commodity structure of trade in services from the point of view, exports are concentrated in tourism, transportation, etc. can take advantage of our relatively abundant natural and labor resources of the traditional service projects, in 2009 only two travel services and transportation services accounted for China’s service trade exports of 57.36% and 58.72% of imports, although both compared with 2008 share of exports or imports have decreased, but still accounted for China’s service trade exports and imports in half. In contrast, in the capital, technology, management experience, a high dependence on services, such as computer and information services, financial services, consulting services, patent services, advertising and promotional services, new services, import and export accounted for China’s service import and export trade, especially exports, the proportion is still small. This shows that China’s service trade development is in serious imbalance. While this structure in the short term will favor China’s economic growth and employment problem, but in the long run, China’s service industry and service trade development will rather dive into negative. In the new service industry sector, the Chinese share of imports is higher than the proportion of exports. This shows with the upgrading of China’s industrial structure continues to accelerate the pace of China’s emerging services for foreign products, particularly in the production of services, increasing the demand for those products, it also shows the development level of China’s service industry and commodity structure of trade in services is still relatively behind and urgently needs to improve service capability based upon technological innovations, eventually speeding up the industrial upgrading of China’s service industry. Finally, a particular note is the emerging service sector cannot support the protection just for the name. China should encourage high-tech service industry to actively participate in international competition in the international market for development, rather than inward looking, blindly seeking government protection. If such practices continue, we will always lag behind the developed countries, and China’s service industry structure will not arise to the point where it aspires to be in near future.